If you’re still raking all your leaves to the curb or packing them into plastic bags, you’re missing an opportunity to create gold. Of course, in this case we mean the kind made from compost—decomposed organic material that can make the soil in your garden or landscape so rich and crumbly that almost anything can grow in it. Compost may be more associated with kitchen scraps. But leaves turn out to be a terrific organic material to make compost from, as well. A leaf is full of the nutrients other plants need to thrive, including carbon and trace minerals. Composted leaves also add fiber to the soil, helping to break up clay and improving the ability of the soil to hold water. Composted leaves soak up rain and moderate evaporation. They are good to add to the soil, but they’re also effective as mulch to put on top of the soil to retain moisture and reduce weeds growth. 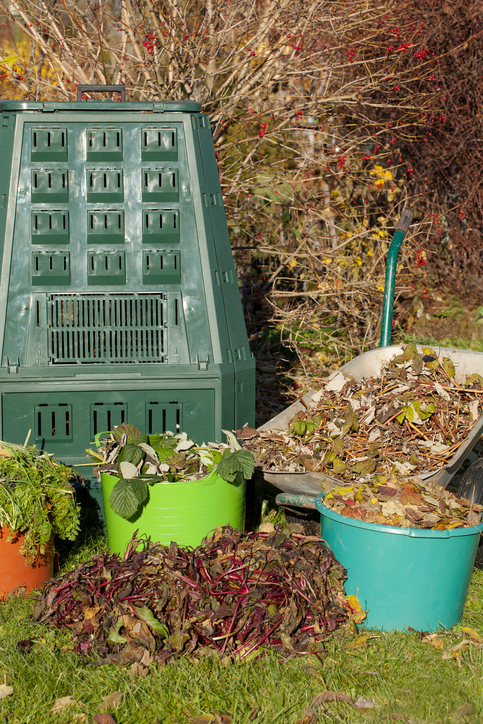 Here’s how to get started building a home composting system. Designate a place in your yard or behind a garage or shed where you can pile up the leaves. You don’t need a fancy compost bin, but if you want to fence one in using chicken wire, that’s easy and cheap to do. You can also use discarded, untreated wooden pallets to create a three-sided box, about 3 square feet, that keeps the leaves somewhat contained as you add them, but makes it easy to build the pile and keep an eye on it. 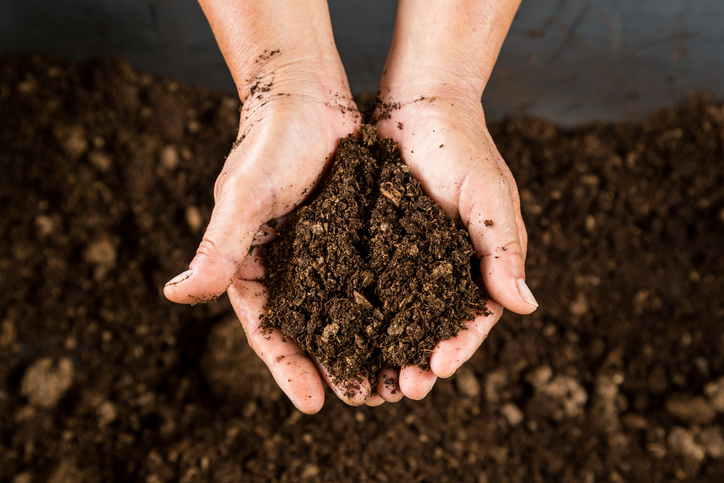 The process of composting breaks down the leaves into soil-like matter. You should accelerate the process by grinding or shredding your leaves before you put them on the pile—otherwise, the leaves will mat and potentially rot. The easiest way to do this is to mow the leaves the way you’d mow your lawn, making sure to keep the clippings basket on the mower. Empty the basket into the compost pile, and repeat for the several weeks that leaves fall until there are no more leaves left. Add some nitrogen to the pile. The nitrogen can be in the form of manure, cottonseed meal, grass clippings, or bone meal. The nitrogen will help accelerate the decomposition of the leaves. Ideally, you’ll lay down a layer 6 to 8 inches thick of ground-up leaves, then an inch of soil and an inch of manure or other green nitrogen source. Or you can add a cup of slow-release nitrogen fertilizer to the mix. Use a tined fork to turn over the entire mixture, then repeat the next time you add more leaves. Over the course of the winter, you can occasionally turn the compost pile to keep it aerated and add a sprinkle from the hose to keep it moist, though you don’t want it so wet it will rot. Turning leaves into compost could take anywhere from six to nine months. That means that the first year you do this, you may not have compost you can use until the end of the next summer. However, late summer turns out to be a pretty good time to work compost into the soil, especially in a garden. And once you get into a cycle, you’ll be producing wonderful compost for your garden that you can apply every fall. Once you’ve cleaned all the dead plants out of your garden, add your leaf compost and work it down into the soil at least six inches, if not a little more. Over the winter, the compost will work its magic! By spring, your soil should be lighter, richer, and maybe home to a few more useful earthworms, as well. But don’t be disappointed if it’s not quite as perfect as you’d like. It may take three or four years for the soil to fully incorporate the compost, which is why you should continue to compost your leaves once you get started. Also, as long as your plants aren’t diseased, you can chop them up and put them in with the leaves to compost. You can also add kitchen scraps, though depending on what they are, it could affect how quickly you create real compost. You probably don’t want to add meat and bones for two reasons. One, animal products tend to draw rats, foxes, wild dogs and cats, and other animals. Two, meat and bones only decompose under very hot temperatures. Your compost pile will heat up through the decomposition going on in the pile. But in all likelihood, it will not get hot enough to totally break down these foods. Remember that compost can be used around trees and landscaping plants and in the pots you plant for your porch and patio, in addition to a garden. Mowing them up so you can compost them saves a lot of time and isn’t nearly as back-breaking as raking them, either. Have you tried composting with leaves? Share your experience with us in the comments below!